Brisbane is embracing digital advertising faster than other states, with the Brisbane City Council willing to work with advertisers. 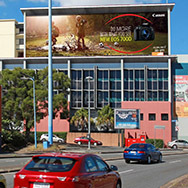 Our resident urban planner and outdoor advertising specialist, Stuart Somerville, is leading the way by helping outdoor media specialists gain approval from Brisbane City Council to install digital advertising devices in the city’s prime intersections. Most roadside outdoor media structures are regulated via a range of state and local government planning laws and policies. Our experience and detailed knowledge of current legislation and government agencies positions us as the preeminent consultancy for signage works. Jensen Bowers offers services such as project management including sub-consultant coordination; negotiation with Council; Town Planning Assessment against Council’s Local Law provisions as well as Surveying including design and drafting. When you engage Jensen Bowers to prepare your Local Law Application, be assured you’re in good hands. We know the process, we know what is required and we have developed and nurtured great working relationships with consultants and assessors to ensure quality and successful outcomes are achieved. If you need our help to make an impact on Queensland’s commuters, contact Jensen Bowers on 07 3319 4933 for expert advice and knowledge.